Seven days after the landings the 36th had penetrated 250 miles into France at Grenoble. Down south French forces broke into the two great ports of Marseilles and Toulon, forcing German Field Marshal Johannes Von Blaskowitz to try to extract his Nineteenth Army or suffer being hemmed in by the swiftly-enveloping Seventh Army to the north. The Field Marshal chose the Rhone Valley as a direct route back to Germany. At this time, August. 2 1, with Division elements scattered over four widely separated sectors, namely: Grenoble, at Gap and Guillestre, at Digne, and still in the Beachhead, the Commanding General of the VI Corps, Maj. Gen. Lucian Truscott, ordered the 36th to block the German retreat up the Rhone Valley and at the same time to block any German reinforcements which might come from the north. The enemy suffered prodigiously at Montelimar. German dead lay smouldering in the aftermath of battle. From the hills lining the Rhone Valley north of Montelimar, reconnaissance units of the Butler Task Force watched enemy traffic stream up the main valley road, and blocked enemy armor trying to get there through Puy-St. Martin. Battle was joined on August 23 as a battalion of the 141st Infantry, advancing on Montelimar from the north, was stopped one kilometer short of the town, small-scale counterattacks developing along its flank. By midnight enemy infiltration threatened its supply lines and the battalion was forced to withdraw. With increasing fury, as more and more troops were penned in a smaller and smaller area, the Nineteenth Army dashed itself against the thin, tenuous 36th Division line, the only bar across its escape route to the north. Enemy activity was reported around the entire perimeter of the Division sector. In the early phase both sides alternately sparred for the showdown. More Division troops hastily arrived on the scene and were disposed along a broad front to hem in and cut off the German lifeline. The 142nd rushed over from Gap and Guillestre to defensive positions near Nyons. The 143rd hurried down from Grenoble. It was the 24th before the entire Division was in the area. The 2nd Battalion, 143rd, reversed its field and swung toward the Rhone Valley near Puy St. Martin. At first the Germans held the initiative because the 36th, having to cover not less than 25 miles of front, was not concentrated. The enemys impending power-blow from the south could take any one of several directions. With a bold oblique thrust to the east, the Germans might have disrupted the whole VI corps operations, severing the only artery up from the beaches. General Dahlquist elected to defend along the little Rubion streambed (in front of a vital supply road) on a flat bowl-shaped plain backed up by a wall of hills. Division artillery went into the hills, from there began to fire missions in a great are south, west and north. At the Rhone side of the line Division troops were committed to putting a final seal on the main valley highway. P-47s swooped in, pounded and destroyed all bridges across the Rhone, forcing the enemy to remain on the east bank. The Germans in the pocket massed about three divisions strong, determined to preserve their escape route. The crack I 11th Panzer Division was one of them. On two successive days regiments of the German 198th Division bolted against the center of the Rubion line at Bonlieu and were thrown back in a fury of fighting by battalions of the 143rd and 142nd. The 141st, in the hot corner near the Rhone, faced incessant enemy attacks striving to brush them away from Highway Seven. In turn, on the evening of August 25, the 141st attacked and cut the valley road at a narrow neck of the Rhone south of La Coucourde. But quickly, the enemy piled more and more power onto the block, forcefully smashing it soon after midnight. The Germans lost heavily in men and equipment, but reopened one narrow floodgate. Our artillery then partially dammed the gate with the wreckage of fleeing vehicles, but still the Germans plunged on. A second roadblock to the north, thrown tip by the Recon troop near Allex, was forced at daybreak by overwhelming German power. Now, though the 36th had almost surrounded the Nineteenth Army, the Germans were on three sides of the Division. Artillerymen turned their guns 180 degrees to pummel German armor threatening Grane and Crest on the north. Twisted steel skeletons of enemy transport at Montelimar lay like carefully constructed road blocks. German vehicles were smashed by our artillery and air corps. The Division held hills in background. Heavy fighting raged until the 30th. Further efforts to seize La Coucourde and to recapture and block Route Seven were not completely successful though much damage was inflicted on the enemy. The 3rd Battalion 143rd, held the vital Magranon Ridge near La Coucourde, overlooking Route Seven, during three days of critical fighting. Cut off and isolated into small groups at one time, the battalion fought on to decisively defeat the German forces. This action won it the Presidential Citation. 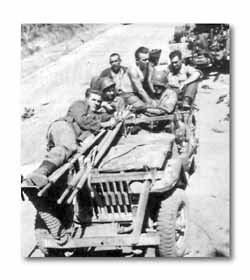 Passing segments of a knocked-out enemy convoy, Division aid men bring back a German who has been wounded. Toward the end Division forces were shifted northward to strike again along the Drome River Valley. On the 29th the 143rd shattered German forces around Loriol, counting over one thousand prisoners in the final mop-up. The 142nd seized Livron on the 29th but straggling groups of Germans resisted strongly through the next day. Then 3rd Division elements, pressing the Germans up from the south, contacted the 141st on the 29th near Clary. It was the artillery at Montelimar that counted most and swayed the tide of battle. During the eight days Division field artillery battalions 131st, 132nd, 133rd, 155th-fired well over 37,000 rounds at the confined, retreating army. Supporting fires from attached battalions--141st, 977th, 93rd Armored-brought the total number of rounds expended to considerably more than 75,000. The German losses were prodigious. Key terrain held by the infantry allowed gun positions to be disposed in such a manner that the route of German withdrawal along the Rhone was under fire for sixteen miles. 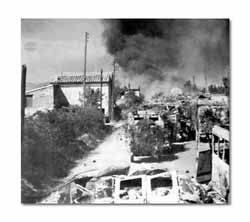 Long convoys were destroyed, and the entire zone was literally covered with a mass of burned vehicles, trains, equipment, dead men and dead animals. Hostile attacks, initiated simultaneously from three directions, were hammered and repulsed by the same paralyzing barrages. Physical road blocks of exploding ammunition trucks and flaming transport occurred so often that long lines of German vehicles were forced to stop, enabling the artillery and air corps to inflict great damage upon them. There were 11,000 enemy casualties. He lost 2,100 vehicles. 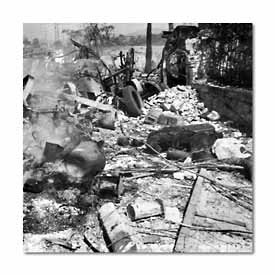 1500 horses perished and the artillery pieces of two divisions were destroyed. 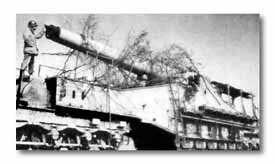 The Germans lost six 380 mm. railroad guns---the potent, long-range harassing guns. Yet, with such terrible destruction the enemy fought well. Even on the last day of battle, when the initiative had passed conclusively into the hands of the 36th, and the 3rd Division had linked up with it, Col. Paul Adams, commanding the 143rd, reported to headquarters, "Im expecting a fight." At six oclock in the morning, the last German counterattack had formed in the vicinity of La Coucourde, but in an hour the drive had been repulsed and the attackers destroyed or captured. One Schneider and Co. railway gun, 1918 vintage, reached the end of the line in La Courcourde. At Montelimar the German Nineteenth Army was virtually destroyed. As a result the enemy was unable to draw a defensive line until our forces had crossed the Moselle River.